we won’t want to enter Heaven until we have been totally purified of sin! It can be helpful to look at God as Un-sin. In fact, it is very helpful to realize that sin always harms us (that is, always), so that if we are tempted to sin we might want to consider its harmful consequences (and our sin doesn’t just hurt us : – it also hurts those around us). It is also very helpful to realize that we cannot be united to God in Heaven – in a union of pure and everlasting love – until we, too, have become un-sin. “Nothing impure shall enter Heaven” (Revelation 21: 27). Now if we look at the beginning of the Kingdom of the Incarnation, we can see that it constitutes a major invasion of un-sin: in Jesus who is Infinitely Un-sin; in Mary Immaculate, conceived without sin; in Saint Joseph, the lily of purity; and in Saint John the Baptist, sanctified in his mother’s womb (Luke 1: 15) And the Apostles, too, through trial and struggle, became increasingly holy and un-sin. Sin, the deadly enemy, is confronted by un-sin at the commencement of Jesus’ Kingdom. There is no stronger and more continuous condemnation of sin than in the 27 documents of the New Testament (it is in this light that I must say that Pope Francis’ seeming aversion to preach Catholic morality is so very troubling). When we enter Heaven we will be un-sin, and we will never sin again! Praise God! There are painful purifications ahead, both here on earth and then – for most of us – in Purgatory. These painful purifications are – as Ralph Martin says – our friends. We need grace. Jesus has merited for us a superabundance of grace. Jesus says, “Without me you can do nothing” (John 15:5). But here’s the good news: Jesus, who is Infinitely Un-sin, lavishly shares His Life with us (most especially in the Holy Eucharist), so that we might truly be to the Father – through our sanctification – Jesus’ Unsinful life. Oh Mary, conceived without sin, pray for us! 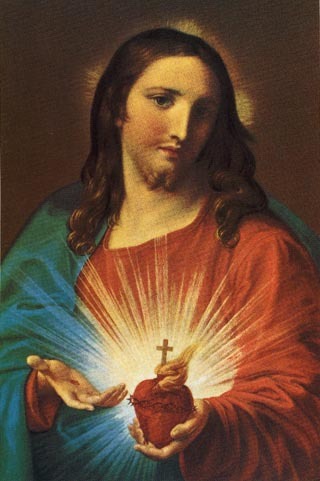 Image: Sacred Heart of Jesus by Pompeo Batoni, 1767, Public Domain, U.S.A. In the all-important devotion to the Sacred Heart of Jesus a “great horror of sin” is a key component of the devotion (see p. 97 of The Devotion to the Sacred Heart by Fr. John Croiset).